Daily Bible Verse 101: Jesus is still teaching with authority. “What is this? A new teaching with authority." (Mark 1: 27). The people of Nazareth noticed something peculiar about Jesus the first time He walked into the synagogue. But after reading and interpreting Isaiah's prophecy on the Messiah, Scripture records that their eyes were transfixed on Him. 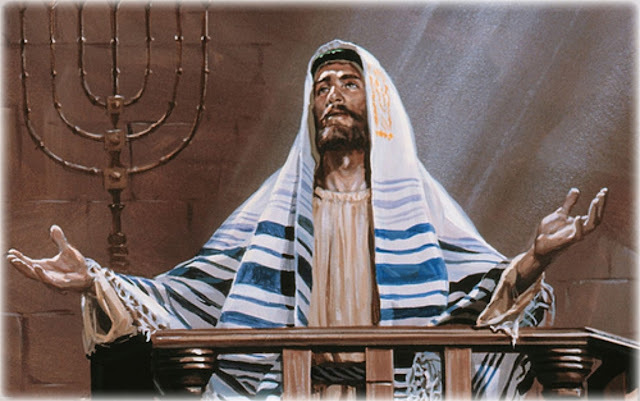 On another Sabbath, Jesus "entered the synagogue and taught. The people were astonished at his teaching, for he taught them as one having authority and not as the scribes." (Mark 1: 21 - 22). Jesus taught with the authority of Moses and all the prophets combined plus something different: "A new teaching with authority." (Mark 1: 27). After His Resurrection, He breathed on His Apostles and imparted them the Holy Spirit. Then before He ascended into Heaven, He gave them the authority to go to all the world and teach and evangelize all people. This authority has been exercised by the Sacred Magisterium of the Church from the very beginning to today. The Church exists to evangelize. Are you part of this effort?